(TibetanReview.net, Jul16, 2017) – Jailed Chinese Nobel Peace laureate Liu Xiaobo who passed away on Jul 13 was cremated on Jul 15 at a private ceremony and his wife who has for years remained under house arrest is finally “free”, Reuters Jul 15 cited a government official as saying. However, China’s state-run media has continued to taunt the deceased democracy activist, calling him a “despised” criminal who was out of step with Chinese society and the 2010 Nobel Peace Prize for him a “blasphemy” of the award. Liu, 61, died of multiple organ failure in a hospital in Shenyang, capital of Liaoning Province, where he was under treatment for about a month for late-stage liver cancer, having been given medical parole but not freed. The moderate 1989 Tiananmen Square protest activist was jailed for 11 years in 2009 for “inciting subversion of state power” after presiding over and helping to write a petition known as “Charter 08″ calling for sweeping political reforms, including urging the Communist Party of China to give up its monopoly on political power. 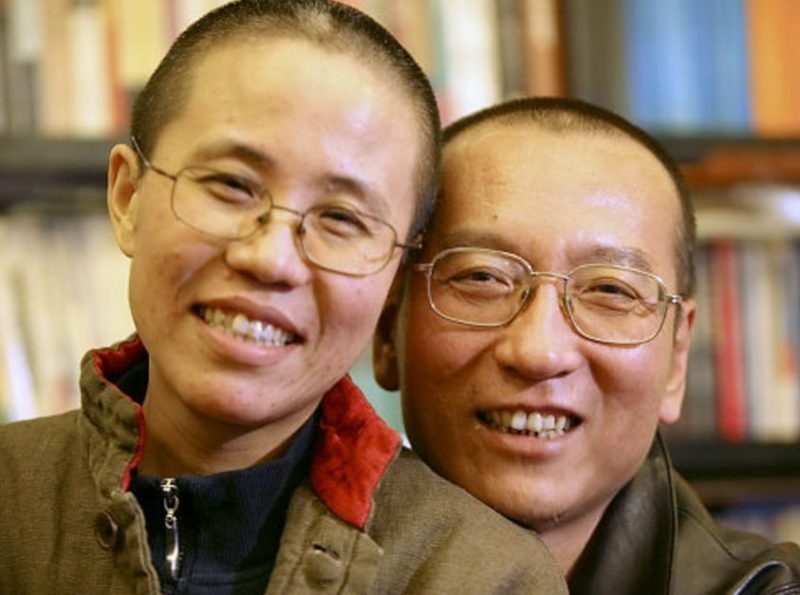 Liu’s wife Liu Xia, an artist and poet in her own right, has been under house arrest since her husband won the Nobel Peace Prize. She was allowed to visit him in prison about once a month and was never formally charged with any crime. However it is not clear whether she is really free as claimed. The report cited city government information official Zhang Qingyang as saying Liu Xiaobo was cremated in accordance with his relatives’ wishes and local customs and his wife, who was present, was given the ashes. Significantly, Zhang has not said where Liu Xia currently was. As of now, the only information and media photos available are those provided by the Shenyang Municipal Information Office. The latest one shows a photo of Liu Xia watching as her husband’s ashes were being buried at sea off the coast of Dalian in Liaoning Province on Jul 15, as stated in an AP report. The Reuters report noted that the last Nobel Peace Prize winner to live out his dying days under state surveillance was Carl von Ossietzky, a pacifist who died in Berlin in Nazi Germany in 1938.